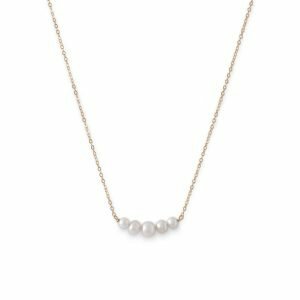 16″ 14 karat yellow gold cable chain necklace featuring a slightly curved fixed wire bar that has 5 near round cultured freshwater pearls measuring approximately 5.5mm, 6.5mm, and 7.5mm in size. This necklace has a spring ring closure and comes packaged on a black felt card inside of a 2″ x 3″ brown cardboard box. The box comes inside of a 4″ x 6″ organza bag. Colors of organza bag will vary and be selected at random. 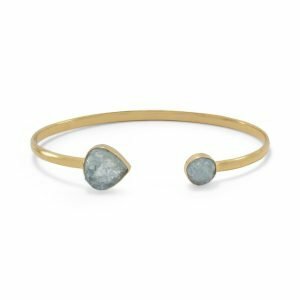 14 karat gold plated sterling silver open cuff bracelet with an 8mm rough cut aquamarine stone on one side and a 13mm x 12mm rough cut aquamarine stone on the other side. The cuff is 3.3 mm wide. 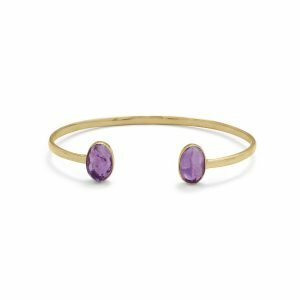 14 karat gold plated sterling silver 3mm wide split bangle featuring an oval shaped 8mm x 11.9mm bezel set rough cut amethyst on both ends of the split. 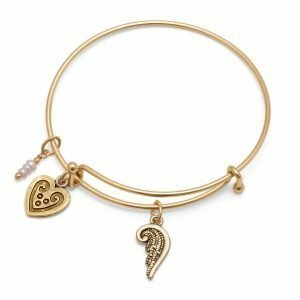 This bangle is slightly adjustable to fit most wrists. 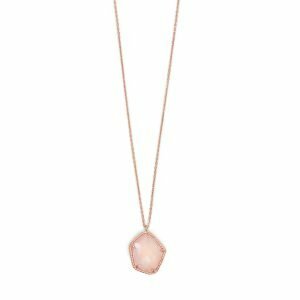 16″ 14 karat rose gold plated sterling silver necklace with pentagon shape rose quartz pendant. The rose quartz is approximately 15mm x 20mm and has a rope edge design. 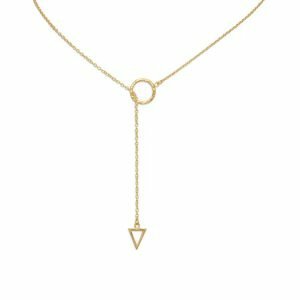 This necklace has a spring ring closure. 14 karat rose gold plated sterling silver open cuff bracelet. 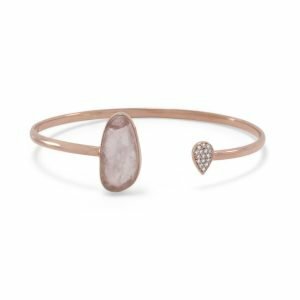 The cuff features a 10mm x 21mm rough cut rose quarts on one end and a 6mm x 9mm tear drop shape with 1.2mm pave CZs on the opposite side. The cuff is approximately 2.8mm wide. 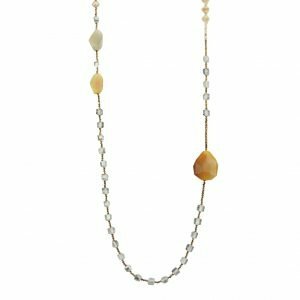 16″ rolo chain necklace with a bar featuring stunning 8mm round faceted fire agate beads, in a range of blue and green earth tones. This necklace has a lobster clasp closure. Handmade in Austin, Texas using the finest American or imported materials. Includes a personally signed card by the designer who crafted the necklace. Four textured sterling silver beaded bangle bracelets. The bracelets are 1.5mm and joined together. Two bracelets have four 6mm beads, and two bracelets have five 6mm beads. The bracelet diameter is 65mm. 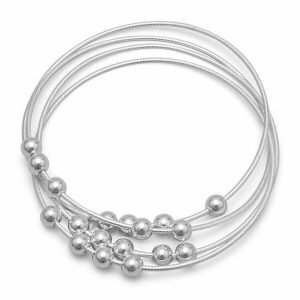 7mm sterling silver bead stretch bracelet. 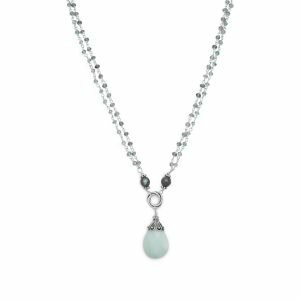 Add some artistic, designer allure to your collection with this double strand multistone drop necklace. This necklace features a strand of faceted labradorite on sterling silver wire and a strand of faceted apatite on sterling silver wire joined together on a decorative 10mm double ring knot spacer. The drop is a 15mm x 22mm faceted amazonite stone with an ornate cap. 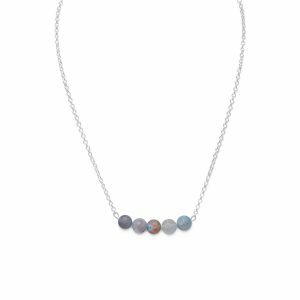 5.5mm – 6mm faceted quartz and labradorite beads accent the necklace. 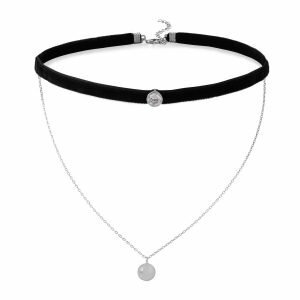 This necklace is 19″ with a 2″ extension. The closure is a lobster clasp. 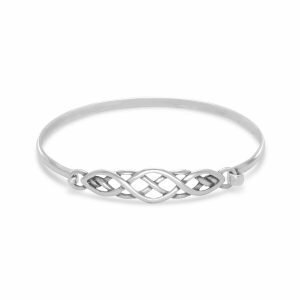 3mm wide bangle features 7 x 42mm celtic design and hook closure. 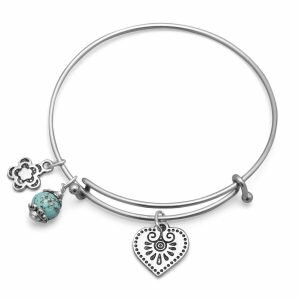 1.5mm expandable silver tone fashion bangle bracelet with a 10mm flower charm, a 15mm heart charm, and an 8mm magnesite charm. 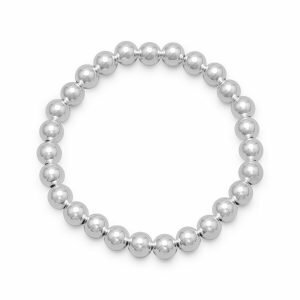 The bangle diameter expands from 64mm to 79mm. Fashion jewelry contains base metal.